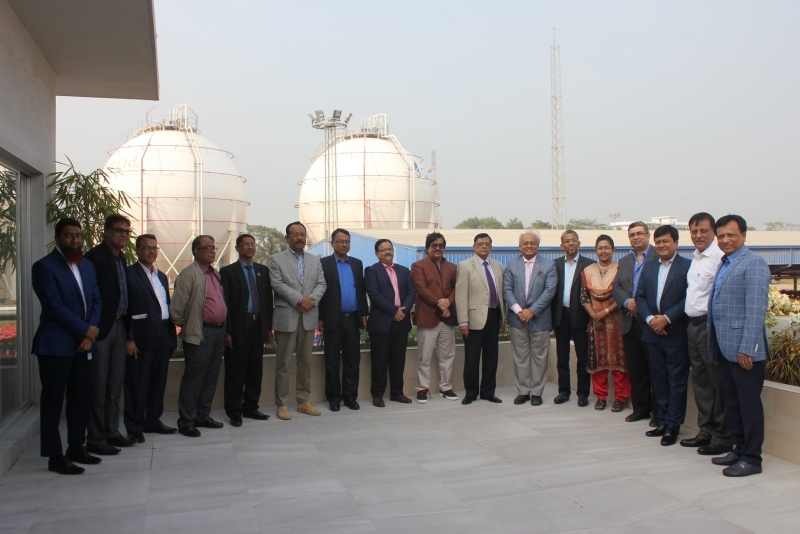 On Thursday 22nd November 2018, a high power team consisting of Board high officials of Agrani Bank Ltd., Investment Corporation of Bangladesh (ICB) and Mercantile Bank Ltd. visited Orion Power Rupsha Ltd. (OPRL) and Orion Gas Ltd. in Khulna. Among others, the team was formed by Dr. Zaid Bakht, Chairman of Agrani Bank; Mohammad Shams-Ul Islam, Managing Director of Agrani Bank; Dr. Mojib Uddin Ahmed, Chairman of ICB, Kazi Sanaul Hoq, Managing Director of ICB; Md. Quamrul Islam Chowdhury, Additional Manaing Director of Mercantile Bank and other senior officials of the banks. Orion Power Rupsha Ltd. is a 105 MW HFO based Power Plant located at Rupsha, Khulna which started its commercial operation from 14th October, 2018 onwards. Orion Gas Ltd. is a LPG bottling and distribution plant located at Mongla, Khulna. Orion Gas has been operating and commercially distributing LPG for last one year with the brand ‘Orion’. Mercantile Bank, ICB and Agrani Bank financed Orion Power Rupsha Ltd., while Agrani Bank financed Orion Gas. The team expressed their satisfaction with the machineries, equipment and latest technology being used in the power plant. Orion Power Rupsha is making significant contribution in mitigating power crisis in the southern part of the country. The team then visited the LPG bottling and distribution plant of Orion Gas Ltd. (OGL) located at Mongla. While experiencing the plant they appreciated to see the facilities with Dutch technology, LPG import jetty, 3,000 MT bulk LPG Storage Capacity and safest technologies being used in the LPG plant. The Chairman of Orion Mr. Mohammad Obaidul Karim; Managing Director Mr. Salman Obaidul Karim, Executive Directors Lt. Gen. Sabbir Ahmed (Rtd.) & Maj. Gen. Salahuddin Miazi (Rtd. ), Company Secretary Ferdous Jaman, EVP Samaresh Banik were present among others from Orion. It’s noteworthy that Agrani Bank Ltd., Investment Corporation of Bangladesh and Mercantile Bank Ltd. have been financing significantly in the Power and Energy Sector of the country for a long time, hence contributing a great extent in national development.